We visited Chicago for 3 days and it felt like we ate constantly. We tried a number of different spots for food in Chicago. Some offered local specialties like deep dish pizza. We made sure to visit the iconic restaurant made famous by Saturday Night Live. 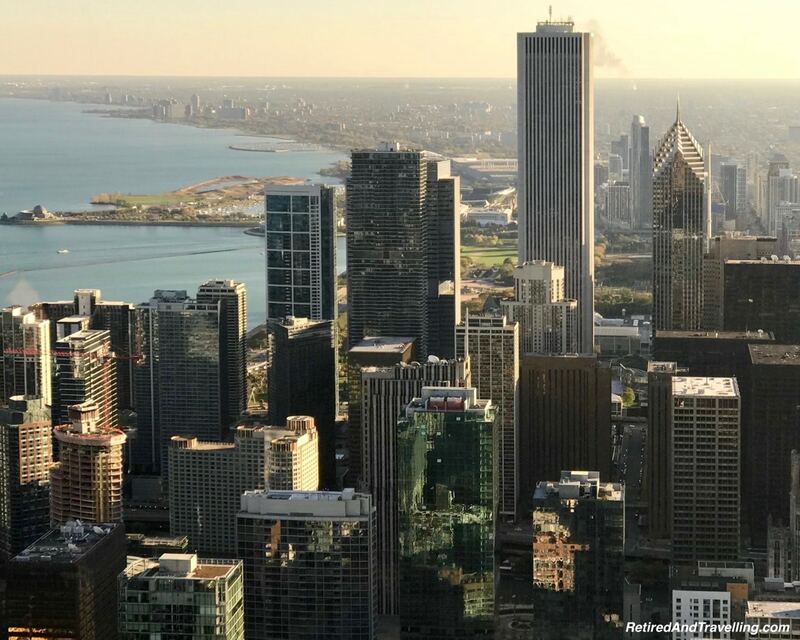 One evening we went up-scale and had drinks with a panoramic view of Chicago as the sun set. And we finished our trip with the most delicious steak dinner. After we tried Garrett’s popcorn, we were ruined for life. And being the chocoholics that we are, we started and ended our visit to Chicago with chocolate. We did a road trip from Toronto to Chicago for 3 days. It was a relatively easy drive with regular stops. Our lunch stop was in the small town of St. Joseph’s. After a disappointing lunch, we headed down the main street to leave town. And then we saw the Chocolate Cafe. It was a sign that we were not yet done with this town. We ordered hot drinks and a large peanut butter cheesecake to share. 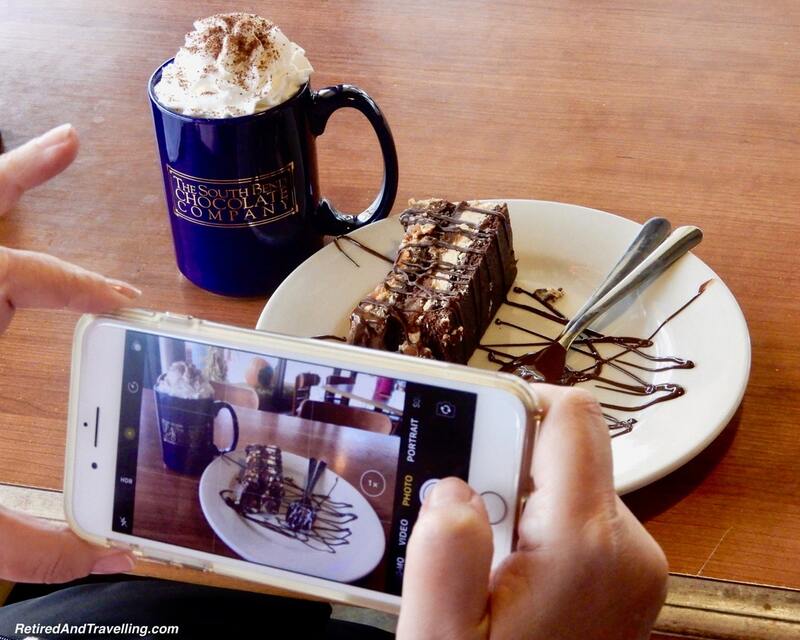 The anticipation built as we made sure to capture the chocolate moment in photos. But it was worth the wait to taste the rich chocolate. While most of the products in the store were chocolate, there was also an interesting mix of candy as well. Halloween was coming up and there were several themed displays. 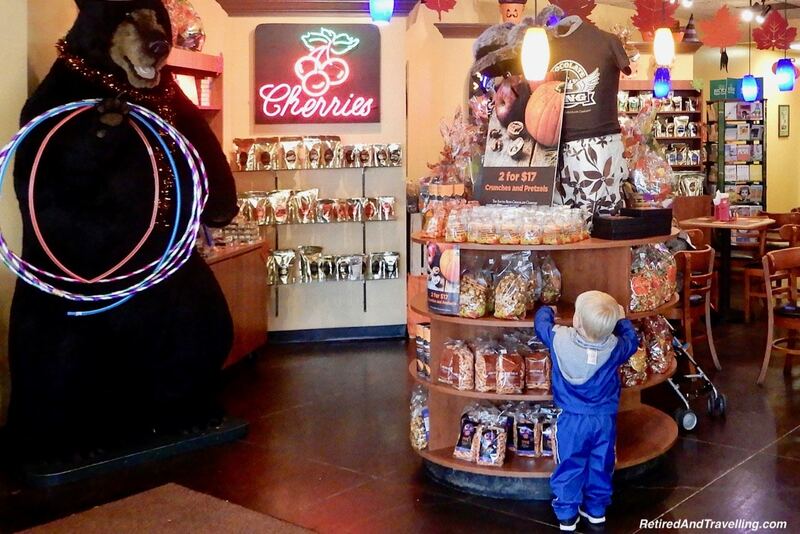 We wandered from display to display, feeling a little like the “kid in a candy store” that we captured in a pic. Our stop in the Chocolate Cafe was our first but not last chocolate treat that first day. 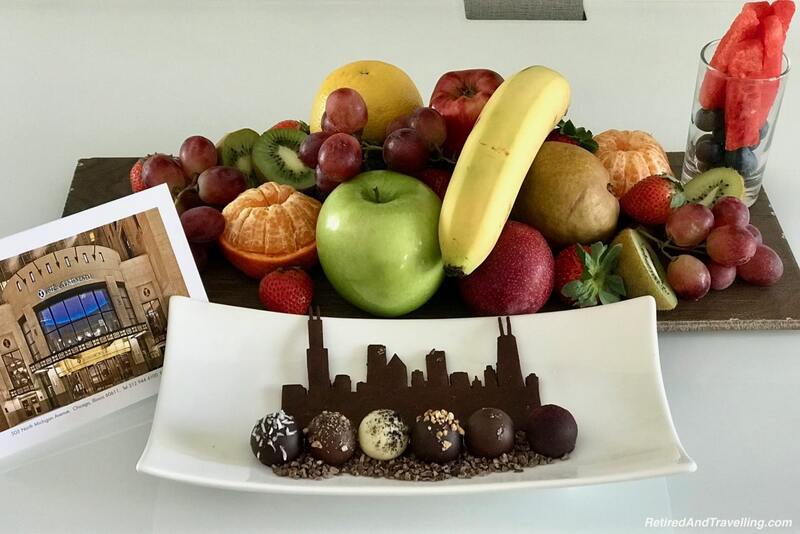 When we checked into the Intercontinental Chicago Magnificent Mile, our welcome amenity covered the top of the desk. There was a great supply of fresh fruit. 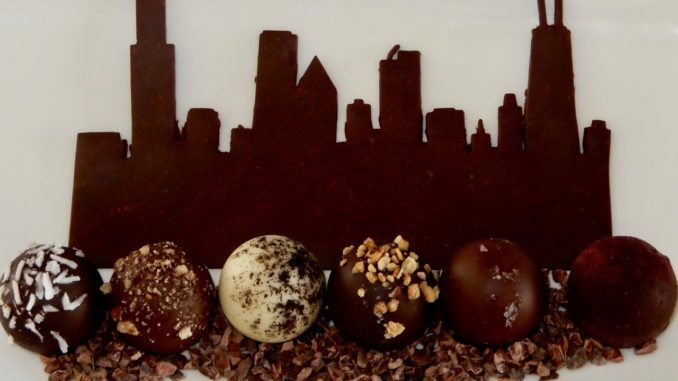 But more interesting was the supply of chocolate truffles that adorned the chocolate silhouette of the Chicago skyline. 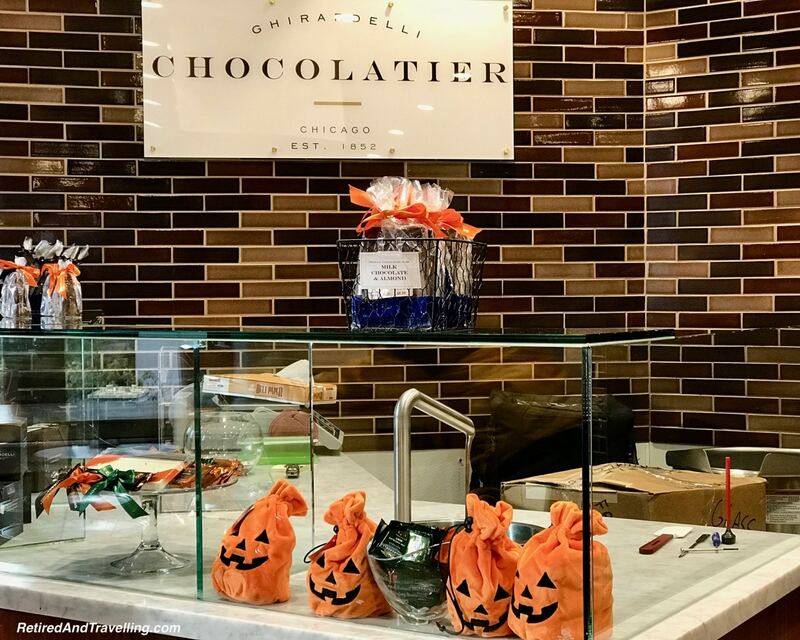 Chocolate was the best kind of food in Chicago to start with! When we travel, we always ask what kind of food the area is known for. David must have asked a dozen people and they all seemed stumped on what was a native Chicago food. The most common answer we got was “hot dogs”. And advice that we should never order our hot dogs with ketchup! Of course, everyone said that we needed to try deep dish Chicago pizza. We are affirmed lovers of real Italian pizza – thin crust, sweet tomato sauce and buffalo mozzarella. We even spent 10 days when we visited Nassau, Bahamas to find real Italian pizza on the island. But we were game to try deep dish pizza when we were in Chicago. 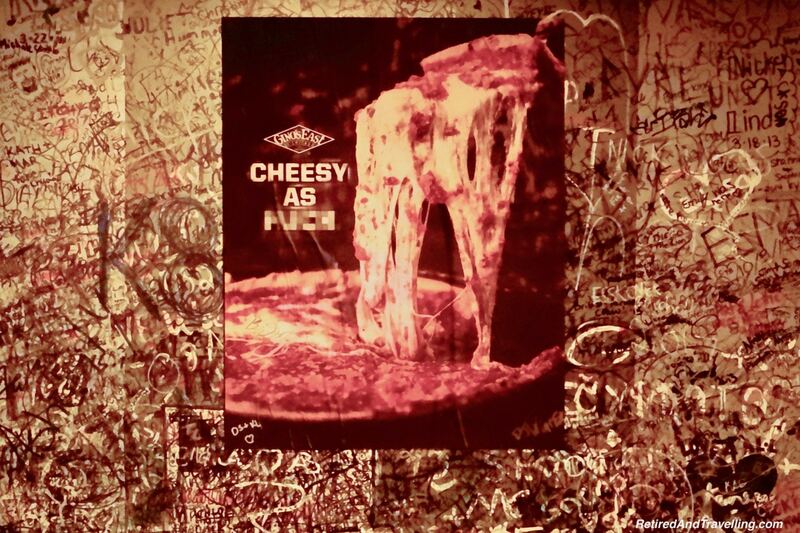 We got several recommendations from our Twitter friends on places to go for deep dish pizza. Giordano’s seemed to be the most common suggestion. 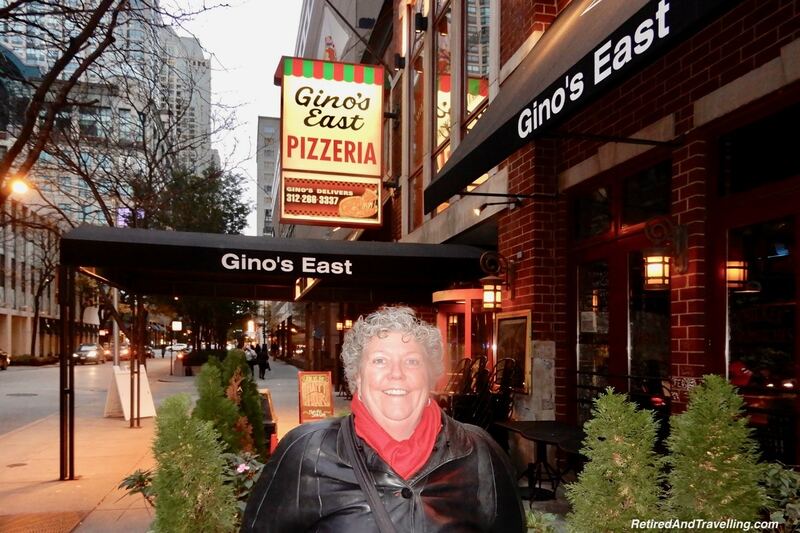 The concierge at the hotel suggested that we needed to go to Gino’s East. It was a short walk from our hotel and we ended up there one day after walking for almost 20,000 stops around Chicago! 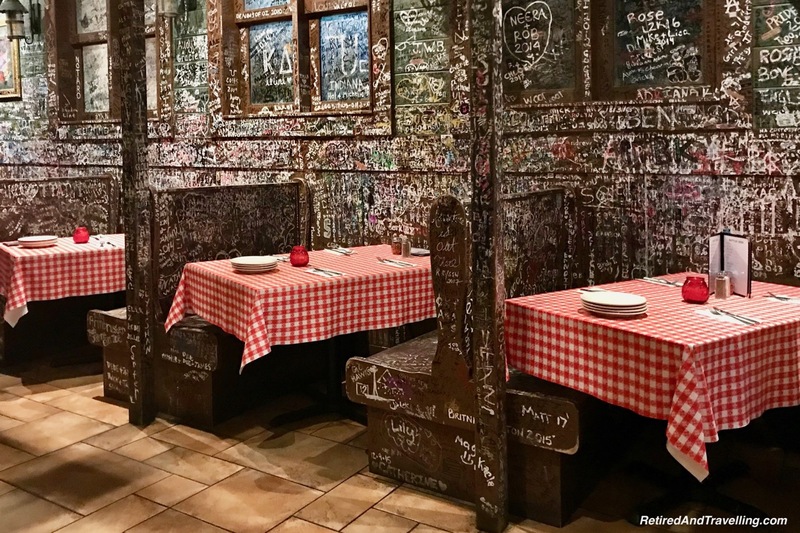 The first thing you will notice about Gino’s is the graffiti everywhere. Walls, booths and tables were covered. 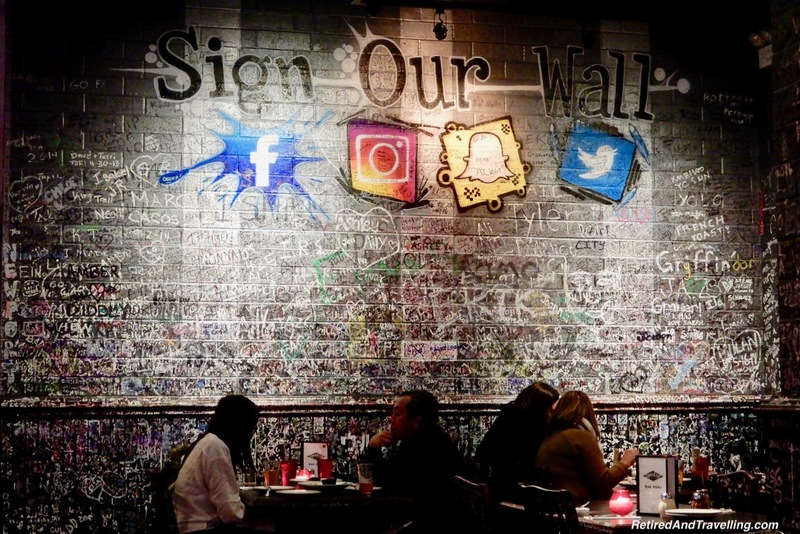 Guests were encouraged to add their own message. Each pizza is made to order and the wait can be up to 45 minutes. We ordered a small deep dish pizza to share with a small appetizer. Even though we were starving by the time the pizza came, a small was more than enough pizza for us. It was thick and dripping with cheese and sauce. Certainly very tasty. But I would not be giving up my preference for real Italian pizza! 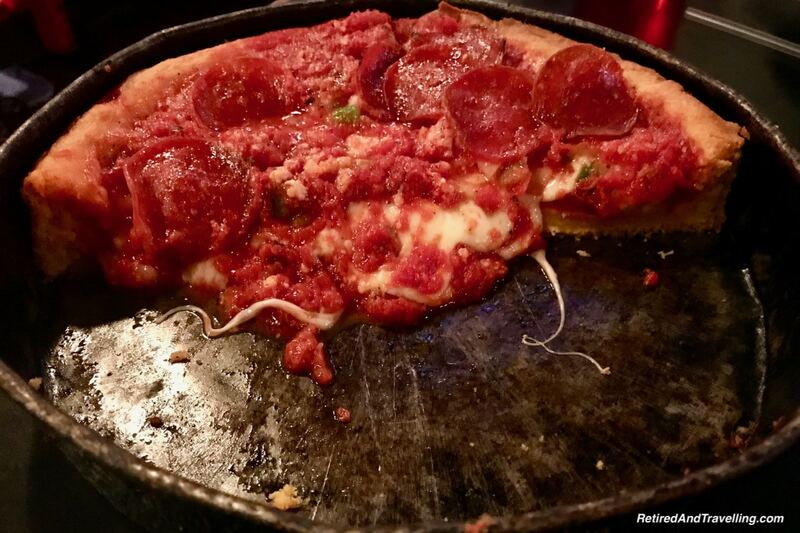 No visit to try the food in Chicago is complete without trying deep dish pizza Chicago style! 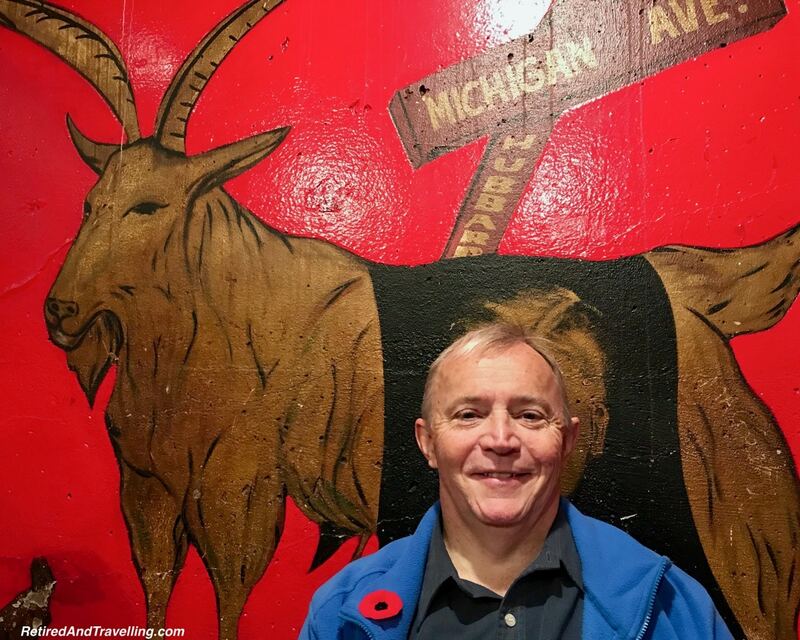 The final iconic place that we visited on our short visit to Chicago was the Billy Goat Tavern. 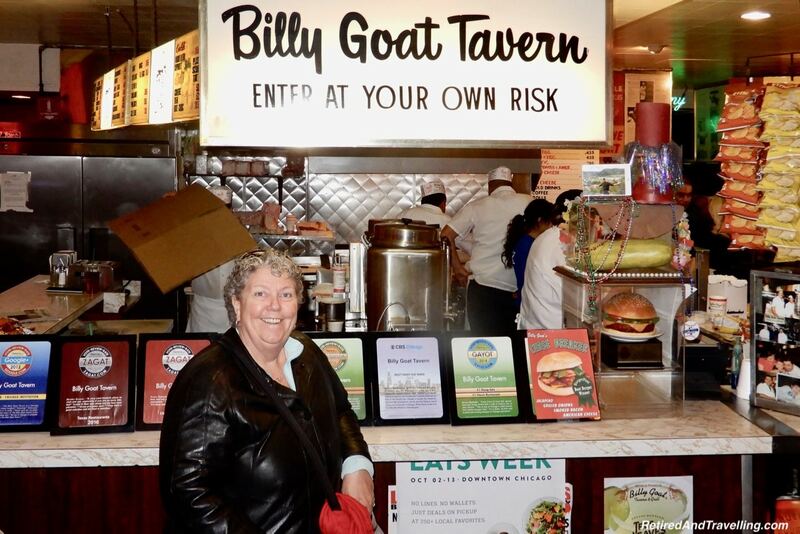 If you are a fan of Saturday Night Live, you may have seen the skits about the Billy Goat Tavern. When we entered, we could hear the owner yelling “cheezborger, cheezborger, cheezborger” in the sing-song way that was made famous on SNL. Of course we had cheeseburgers for lunch that day. 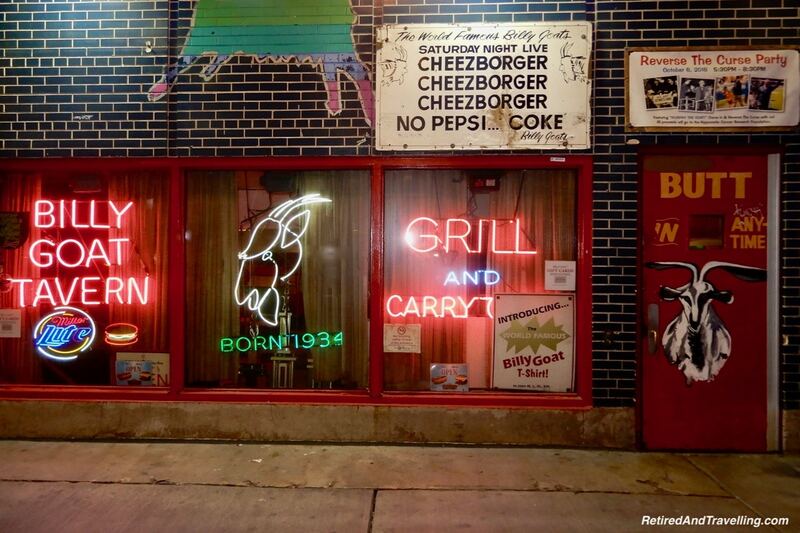 We explored this iconic Chicago shop after we ate. We went to the restaurant close to our hotel but found another one in the chain at Navy Pier. 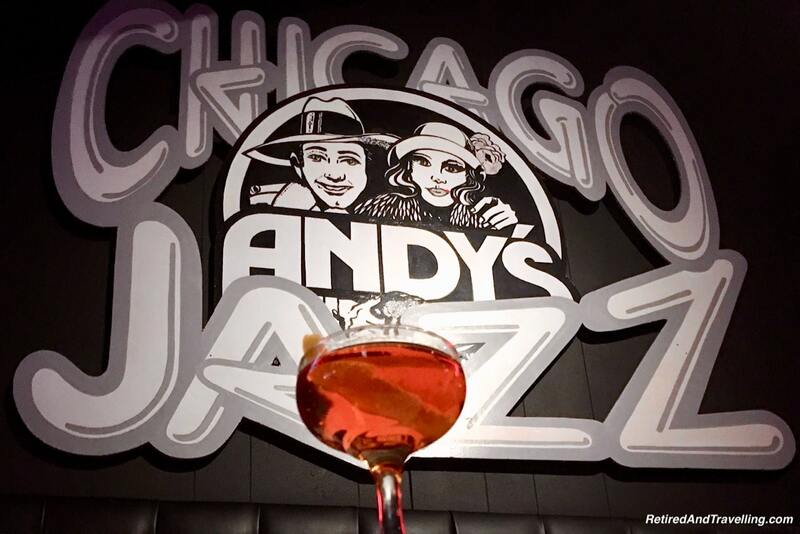 On our short visit, we certainly tried to experience the suggested spots for food in Chicago. 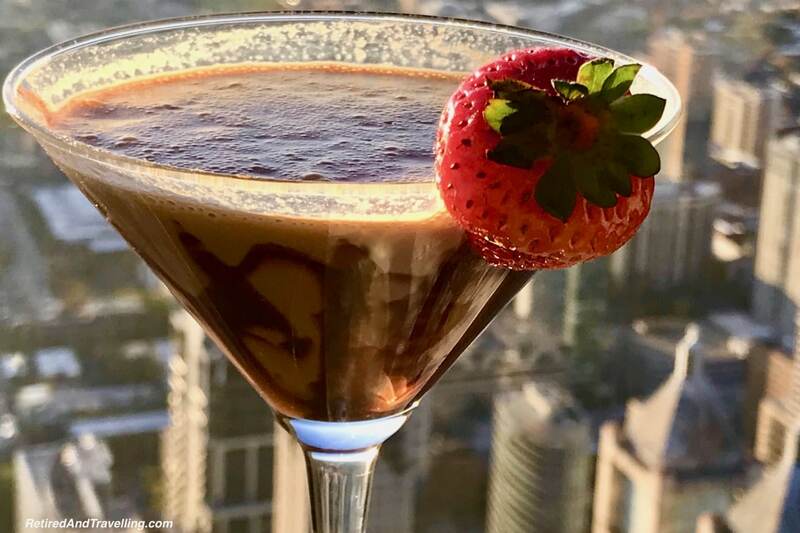 We started our visit to Chicago with a trip up to the 96th floor Signature Lounge in the John Hancock Tower. Friends who visited Chicago suggested that this was a better spot for a panoramic view of Chicago. Patience paid off when we finally snagged a window seat. Chicago was spread out in front of us in all directions as it went from day, to sunset to dark. We ordered off the specialty drink menu to toast our first night in Chicago. An appetizer plate kept us sated while we waited for the sun to set. 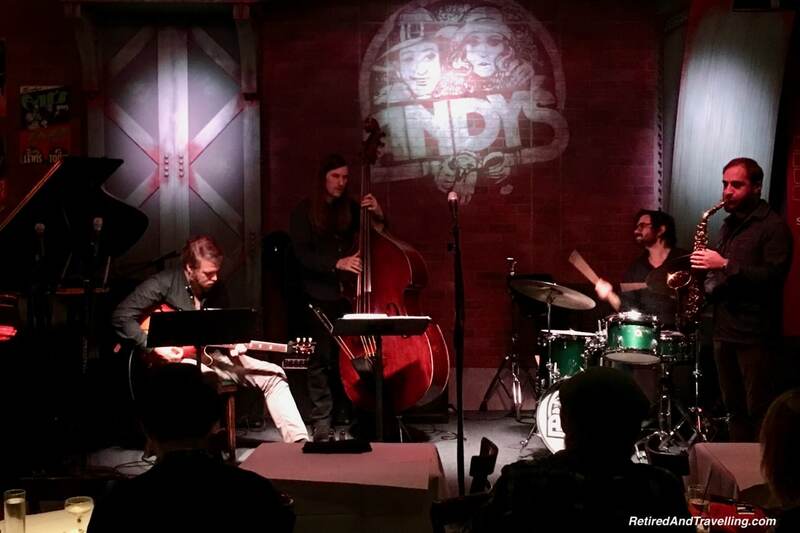 On another night we ventured out for some entertainment at Andy’s Jazz Club. There is a full restaurant and you can book dinner and a show. We had already eaten the night we visited but on a return visit we might try dinner or a snack. The menu certainly looked good. On our last night in Chicago, we ate in Michael Jordon’s Steakhouse located in the Intercontinental Chicago hotel. It was a treat we saved for last night. It was a quiet night so we got undivided attention for the evening. 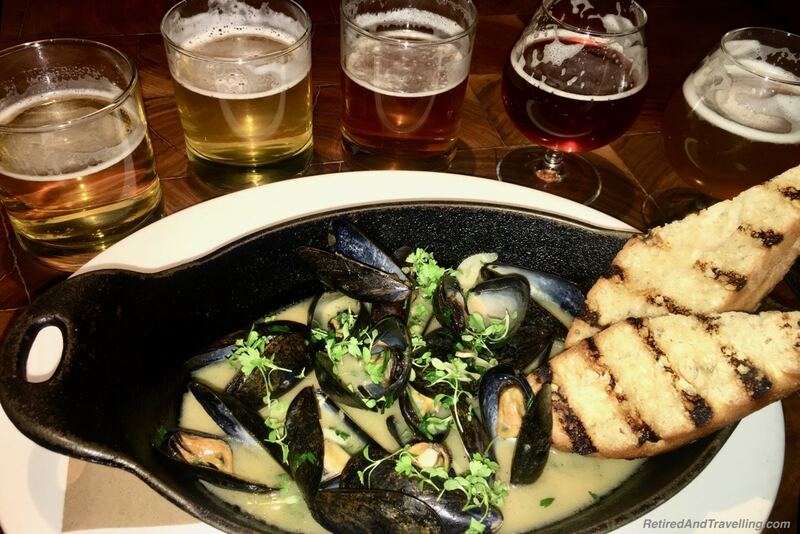 David wanted to try the local beers, so he ordered a flight of beer. An extra two flights showed up with more choices. For appetizers we tried the french onion soup and mussels. We decided to pass on the garlic cheese bread even though everyone raved over it. We got surprised when an order of this delicious bread showed up with our appetizers. 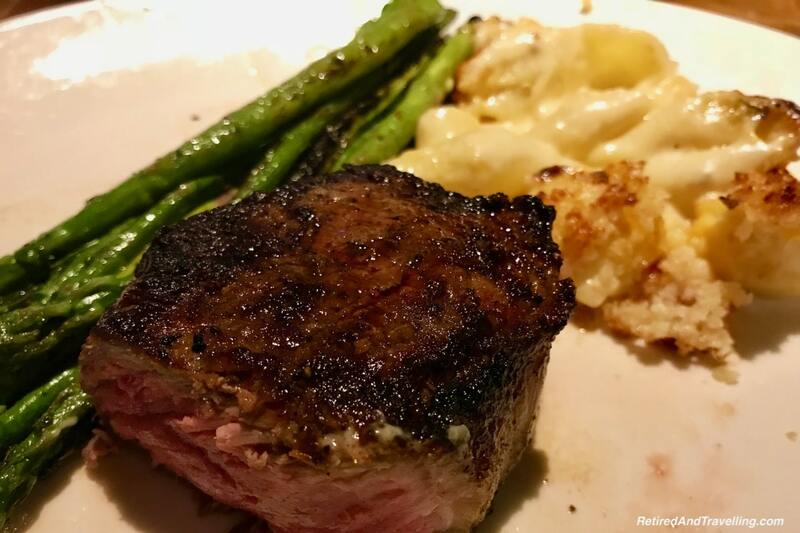 For the main course we shared a large steak with asparagus. 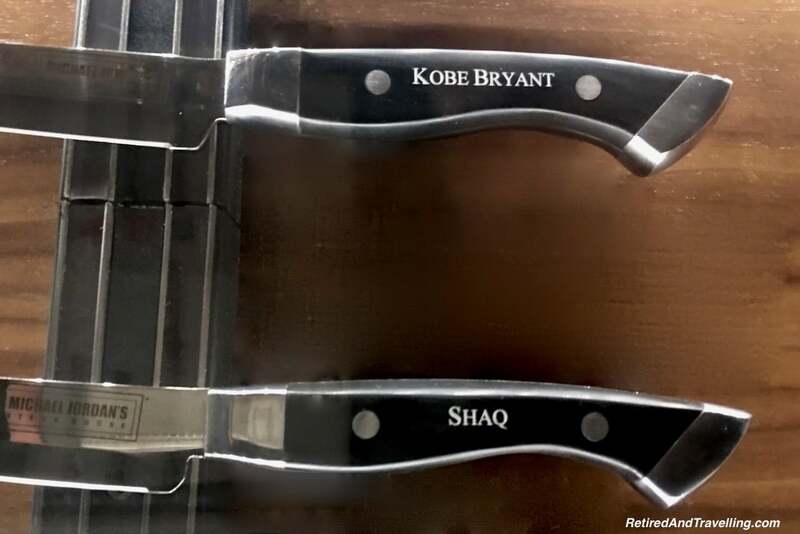 Regulars actually have their own steak knives in a display case. We used the ones at the table. As a side we ordered the bacon topped mac and cheese. Every single thing we tried was so good. 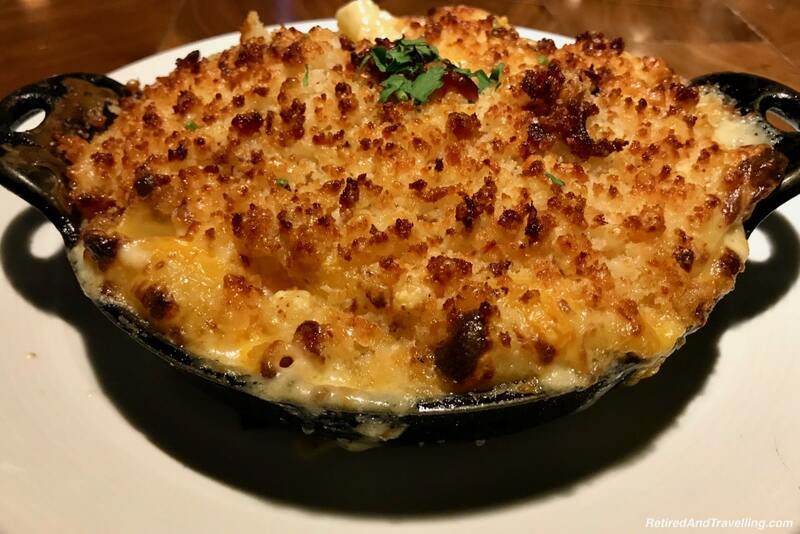 We took most of the mac and cheese away with us and it was a great lunch the next day. Our real food in Chicago left us wanting more. One of the other recommendations that we got was to try Garrett’s popcorn. We didn’t see it in any of the stores we visited. And then as we walked to Millennium Park, a Garrett’s Popcorn store appeared. We did not pass this by! The day we visited, there were several popcorn flavours in the display case. 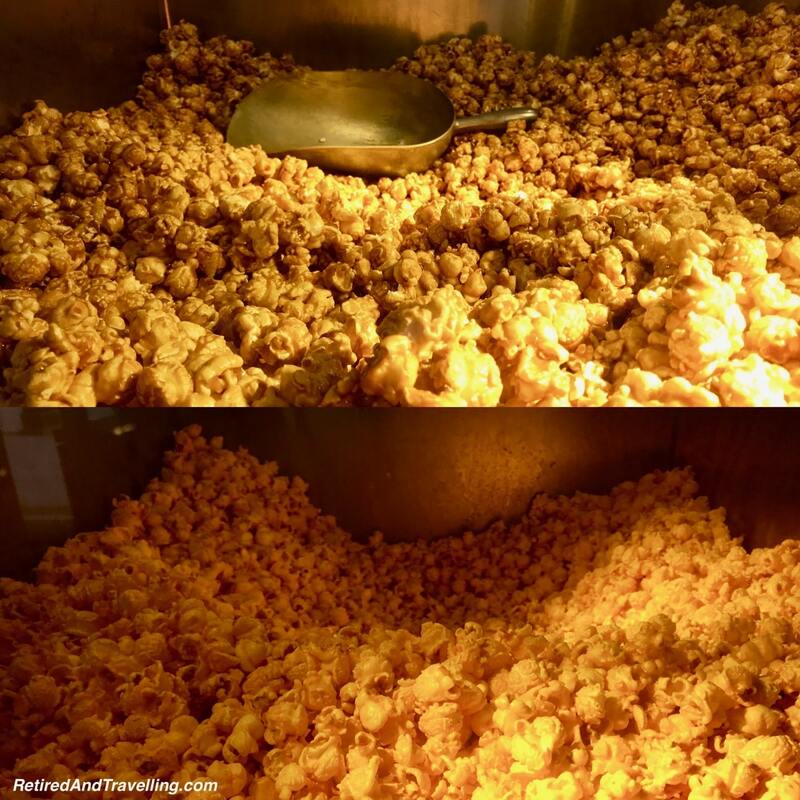 The popcorn is made fresh daily. We figured that since we were in Chicago, we should try the Chicago mix. 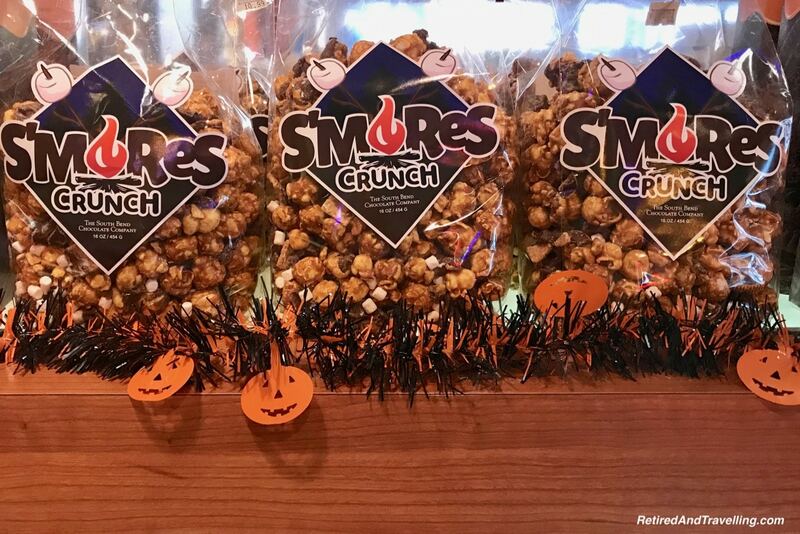 This is a 50/50 mix of caramel and cheese corn. We bought a large bag of Chicago mix. We restrained ourselves until the final hour of our drive back to Toronto. And then we wished we had bought more. The Garrett’s popcorn was the best popcorn we have ever tried. I am not sure exactly what makes the flavours pop and melt in your mouth. 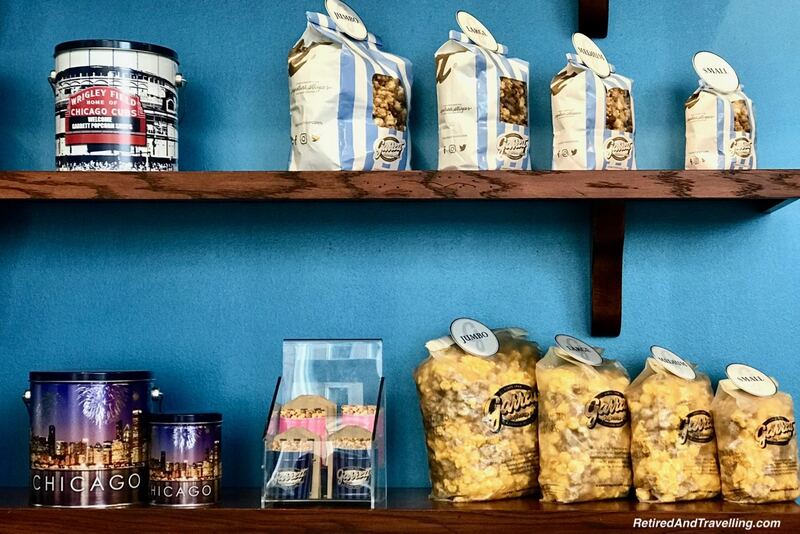 But I sure wish I had tried the popcorn when we were still in Chicago when we could have stocked up. But it is a good reason to return to Chicago. It might not be considered food in Chicago, but it will be a key thing we will eat in Chicago on our next visit. We didn’t eat all of our huge meal at Michael Jordon’s Steak House. 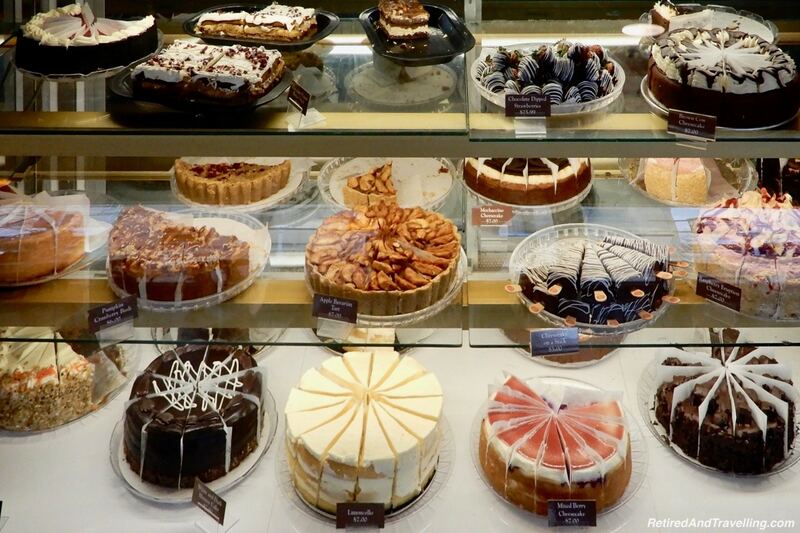 We gazed lovingly at the desserts but decided to pass. 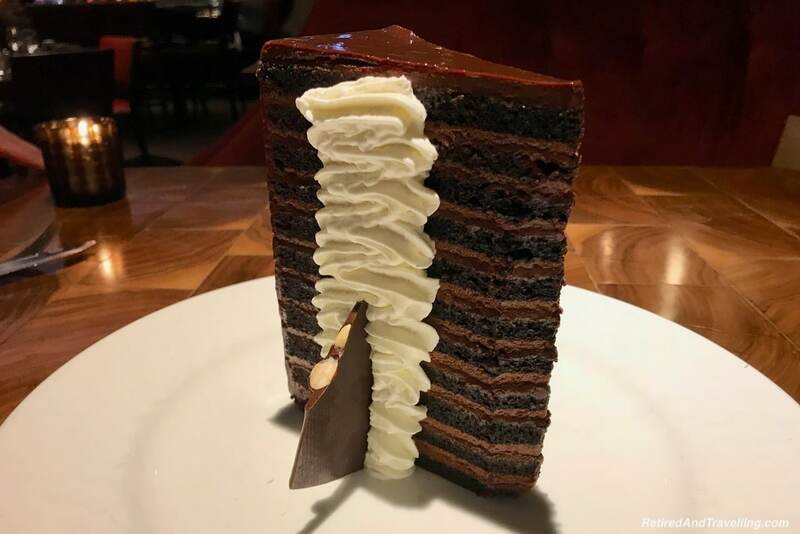 Then to our surprise, a large slice of 23 layer chocolate cake was sent to our table. We took a small slide of the cake to try it and packaged up the rest for the next day. 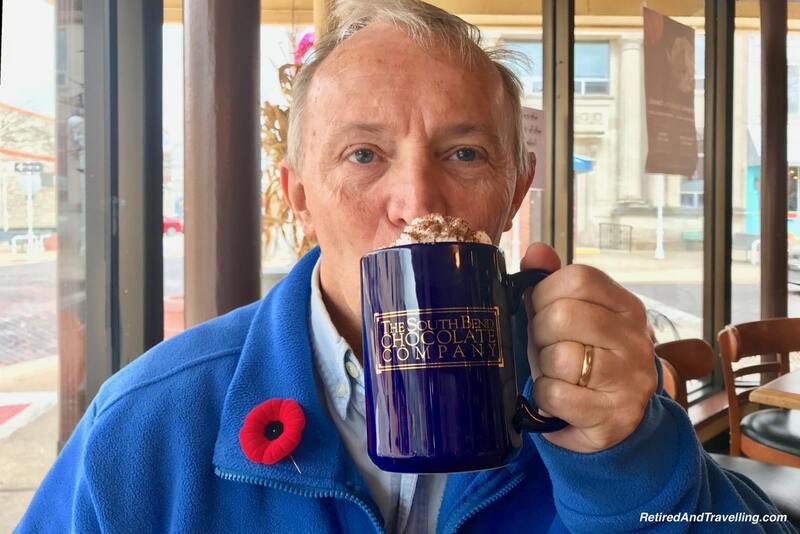 It was so rich chocolate, that a small piece with a cappuccino was all we really needed. Right beside our hotel we found the Dylan’s Candy Bar. We passed it several times as we walked around Chicago. But we would not leave without a stop inside. 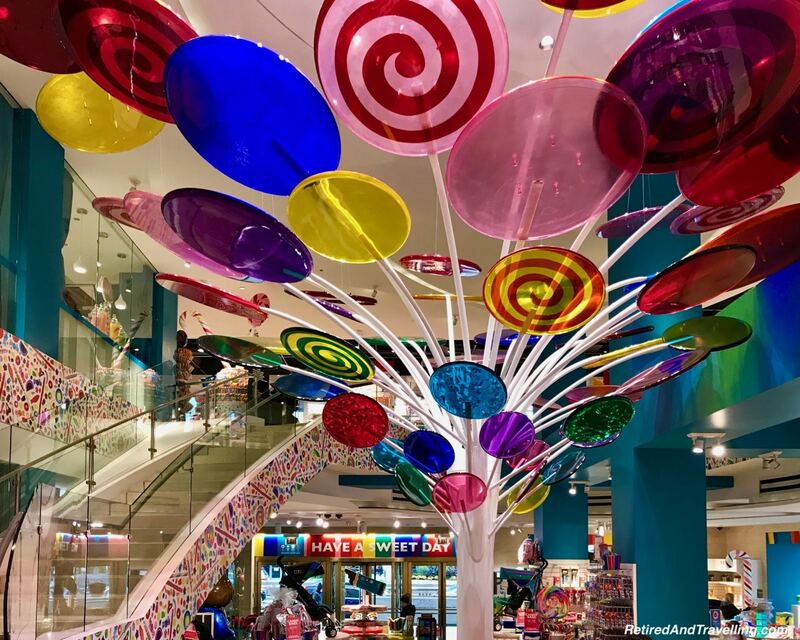 The colourful candy store covered two stories. There was chocolate but so much more. A cafe provided a spot to enjoy a sweet snack. 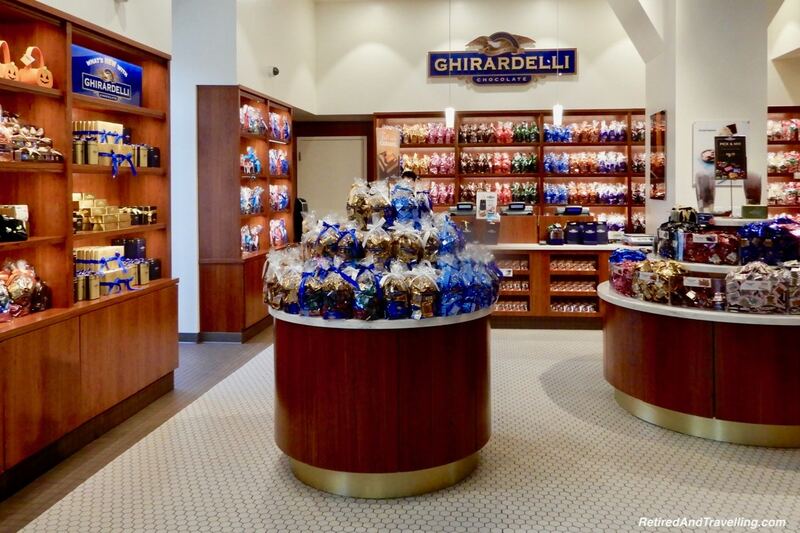 We learned that the Ghirardelli chocolate store in Chicago was the biggest in the nation. 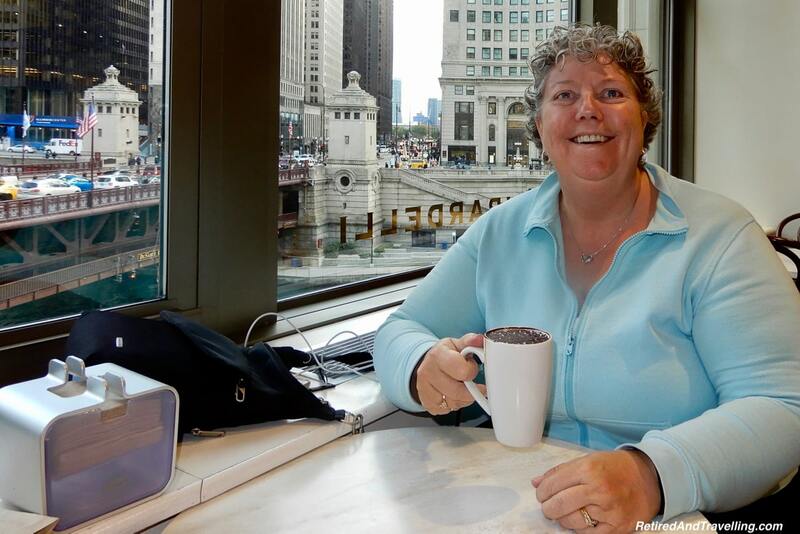 This was more than enough reason to visit the store with the view over the Chicago River. After we got our welcome sample, we walked up the stairs to the cafe. I really had my heart set on getting a large chocolate sundae. But we had just finished our architecture river tour and we needed to be warmed up. Hot drinking chocolate was a much better choice. We sat at our table with a view and enjoyed our final chocolate treat. We toured the store and looked at the historical information. And the great supply of chocolate! Chocolate was the best kind of food in Chicago to finish a great short visit! We ate a lot of food in Chicago and we did not cover all the suggestions that we were given. We would have liked to visit the igloos on the Chicago River at the City Winery. 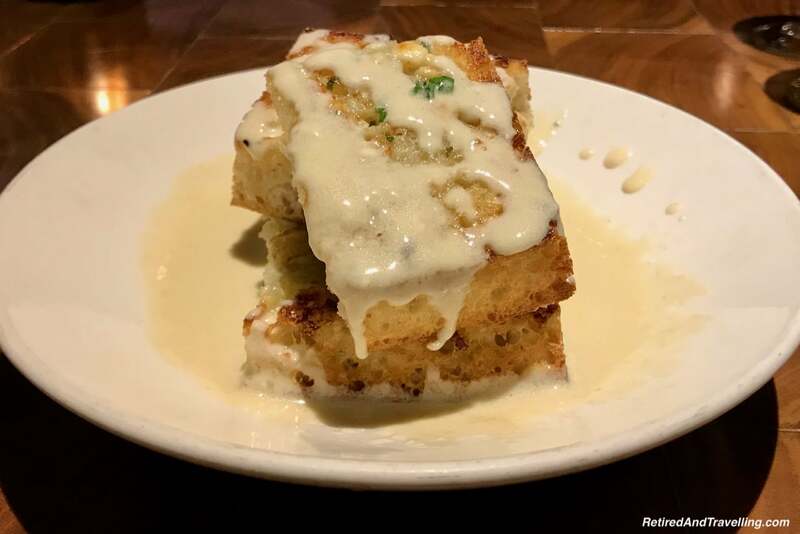 Local food bloggers recommended we try Piccolo Sogno for Italian food. Someone else offered up Cindy’s Rooftop. But we simply ran out to time as we tried to see so much on our Chicago visit. We certainly did not miss trying the sweet food in Chicago. We got a great sample of other food in Chicago. But we know that eating will be a key thing we will do on a return trip to Chicago! What is your favourite food in Chicago? What Chicago specialty food or restaurant would you give a pass? Disclaimer: With one small exception, we paid for all the food talked about in this blog post. We did receive garlic cheese bread and our dessert with coffee complimentary at Michael Jordon’s Steak House. This in no way influenced our enjoyment of the great food or our comments in this post. Once again, you nailed it. We lived in Chicago for two years and in one trip you found all of our favorite spots.